Instructor consent forms are only used by Undergraduate students who are requesting to take a course that is either full or requires instructor consent to enroll. Through Faculty Access, you can set one of three options for your course(s): Printable Consent Forms, Online Consent Forms, or Disable Consent Forms. The Printable Consent Form option will allow students to print a paper consent form for you to sign, granting them permission to register for your course. The student brings the signed form to the registrar’s office and registrar staff enroll the student in the course. The Online Consent Form option activates an online webform that students submit for you to electronically approve through Faculty Access. 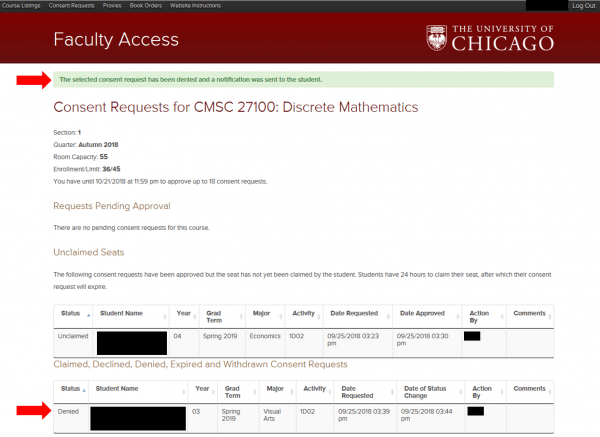 If approved, the student will have 24 hours to register for the course via my.UChicago. After 24 hours, the approval expires and the student can no longer register unless they go through the online consent request process again. Note: You can activate the Online Consent Form once your course(s) for the upcoming quarter appear on your Faculty Access Course List page. However, students will not be able to see or use the online consent form until the Wednesday after the end of the quarter. Click here for more details. To set the consent type, click on the Consent Requests link in the top left menu. Use the drop-down in the Consent Request Format column to select the consent type and click Save Changes. By default, you will receive an email each time a student submits a consent request. To opt out of receiving these messages, uncheck the box at the bottom of the Consent Requests screen and click Save Changes. Note: If you uncheck this box, you will not be notified of pending requests and will need to periodically log in to Faculty Access to review requests. 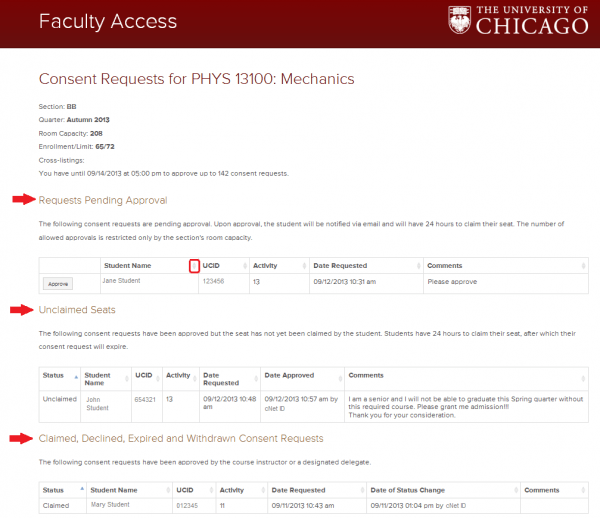 The # Pending Requests column will let you know how many consent requests are awaiting approval in each course. Click on the title of the course for which you want to review pending requests. 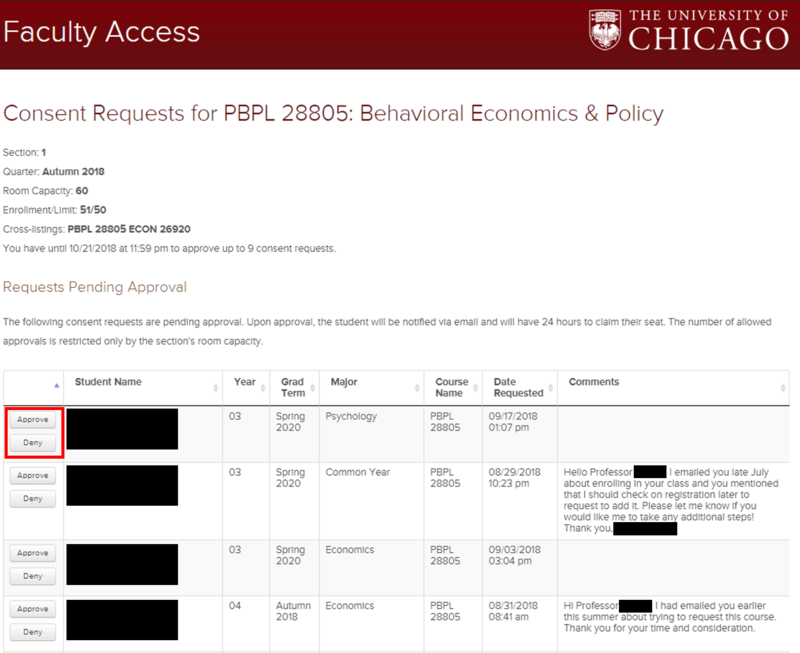 In the Requests Pending Approval section, you will see detailed information about each student, including their name, UCID, Email, Year, Grad Term, Major and the Date of the Request. Students have the option to leave additional comments which will appear in the far right hand side. On the left hand side you will have the option to either Approve or Deny the request. To Approve a request, click on the Approve button. You will receive a pop-up message requesting you to confirm that you want to approve the request since the action cannot be undone. 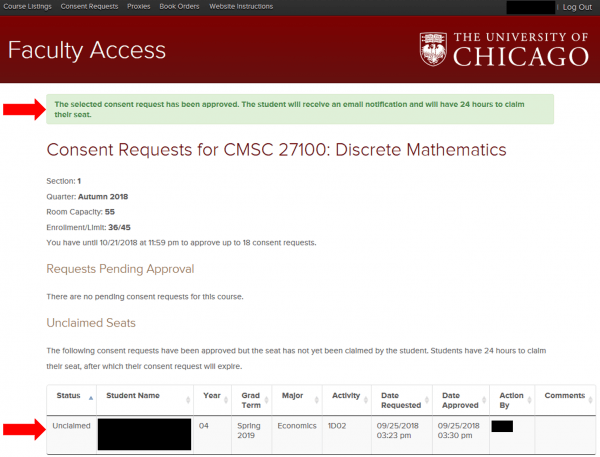 A confirmation message will appear at the top of the Consent Requests screen and the student will show in the Unclaimed Seats section. The student will receive an email notification that their request has been approved. They will have 24 hours to claim their seat and register for the course. After 24 hours, the approval expires and the student loses their seat. To Deny a request, click on the Deny button. You will receive a pop-up message requesting you to confirm that you want to deny the request. This will send a notification to the student. 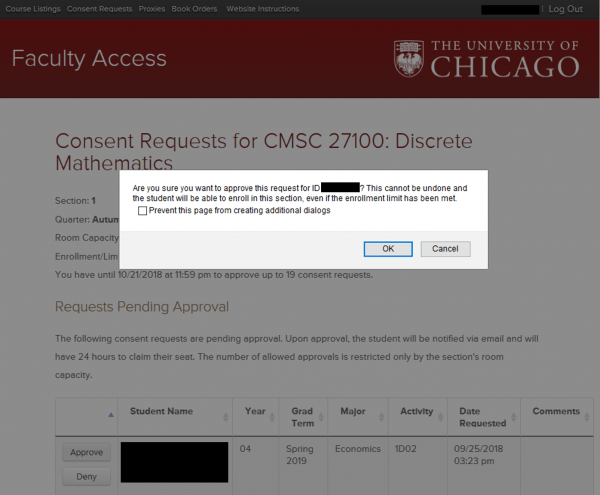 A confirmation message will appear at the top of the Consent Requests screen and the student will show in the Claimed, Declined, Denied, Expired and Withdrawn Consent Requests section below. The student will receive an email notification that their request has been denied. The consent requests status page will list requests in three sections: Requests Pending Approval, Unclaimed Seats, and Claimed, Declined, Expired and Withdrawn Requests. Each grouping will show the status of the request, the name of the student, the status date, and any comments the student included in their request. Rows can be organized by clicking the column header. 3) Both grader and consent approver. To add a proxy, click on the Proxies link in the top left menu. Select the check box next to the course you’d like to assign a proxy and click the Add Proxies button. Enter the CNetID of the person you’d like to set up as a proxy. If you do not know the CNetID, you can find it by going to http://whoami.uchicago.edu/. Select the role for your Proxy. By selecting Consent Approver only, you can click on Continue to review your information for accuracy and then click Submit. By selecting Grader Only or Both grader and consent approver, additional steps, 3 & 4, will appear on the screen requesting that you designate what type of grading (regular or blind) will be used and the time limit (2 years or the quarter only limit) for the proxy grader. Note: Proxy graders are only allowed to SAVE grades. 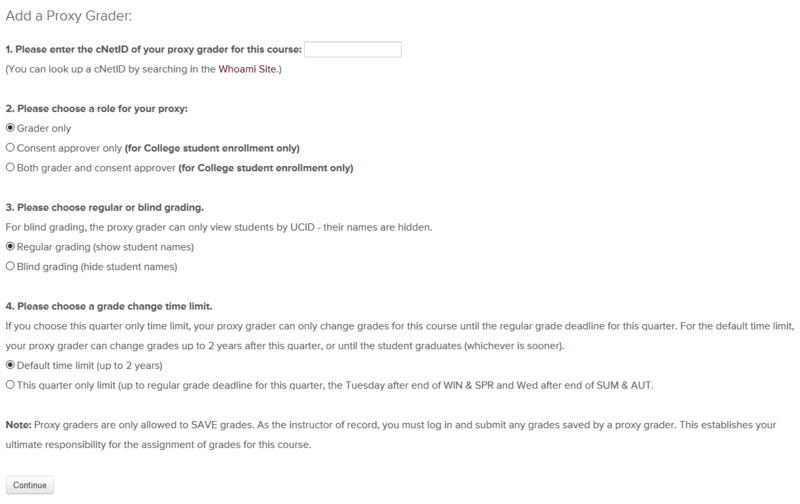 As the instructor of record, you must log in and submit any grades saved by a proxy grader. This establishes your ultimate responsibility for the assignment of grades for this course. Once complete, click on Continue where you can review your information for accuracy and then click Submit. A confirmation message will appear at the top of the screen once submitted. I don't want to use the online consent form. Do I need to do anything? It is recommended that you log-in to Faculty Access and review the consent request format settings for each of your courses every quarter. Most courses, by default, should be set to the Printable Consent Forms option. However, if the course was offered in a previous quarter and the consent type was set to one of the other options, it is possible that that setting from the previous quarter remained on the course when it was created for the upcoming quarter. For information on how to review and/or change the consent request format of a course, see Setting the Consent Type above. How will I know if I have pending requests? By default you will receive an email notification each time a consent request is submitted. For instructions of how to turn off this function, see Setting Email Notification Type section above. You can also monitor the number of pending requests for each course by clicking on the Consent Requests link in the top left navigation menu of Faculty Access. Can students submit multiple online consent requests for one section? 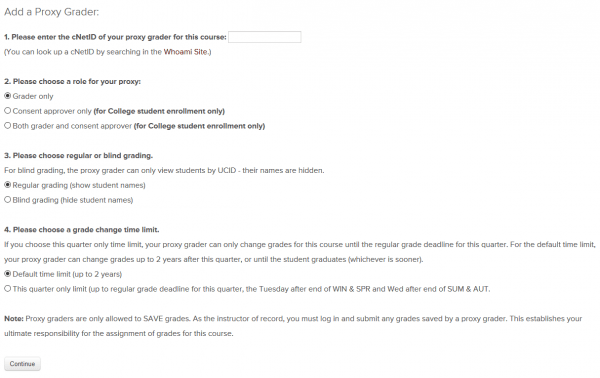 Students can have only one online consent request in pending status per course section. If the student withdrew their consent request, declined the seat, or the approved consent expired, the student can submit a new consent request. When is the deadline to approve online consent requests? Instructors can approve online consent requests until 5 PM, Friday of the 3rd week of the quarter. Students approved at that time will then have 24 hours to claim their seat for the course. Can I accept both paper and online consent requests? We do not recommend using both paper and online methods of consent request for a single course section. Using one consent request type will allow instructors to have more control of their class size. However, if you have set up online consent requests for your course and choose to sign a paper consent form, Registrar’s Office staff will register the student if s/he turns the form in. What are the maxium number of online consent requests that I can approve? The system has been set up to allow no more than the room capacity for a course. Therefore, if you have a full class of 18, but the room can seat a total of 25 students, you can approve up to 7 consent requests. Students are confused about how to use the online consent form. Where can I direct them for help? Information about the online consent form process and detailed instructions are available for students on the Instructor Consent page. I teach graduate level courses, should I be using the online consent form? 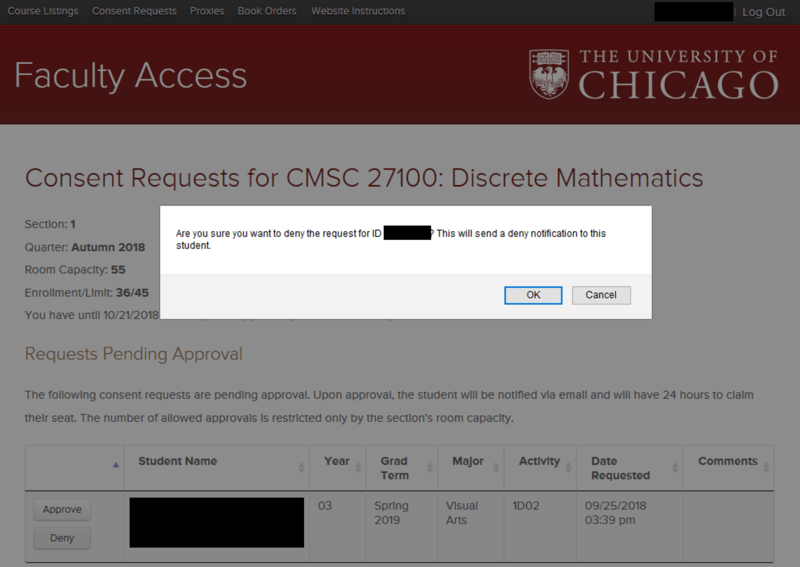 I enabled the consent format I want to use for my course; however, students are contacting me to say that they are unable to see the consent form button on their registration site. Why is this not working? Both the online consent form and the printable consent form do not become available for students to use for the upcoming quarter’s registration until the Wednesday after the end of the current quarter. For example, if students are registering for Winter quarter, they will not be able to access the consent form (printable or online) until the Wednesday after the Autumn quarter ends.